There is a magical salad in the city of Portland that can be found at Lardo. However, not all the time. You have to catch it in season. Or maybe sometimes the chef just doesn’t feel like it. Why you gotta play with my heart like that, chef? I couldn’t wait to try my hand at making this gem of a dish at home. The results? Mega delicious, super simple, perfect for noshing down on lots of greens. 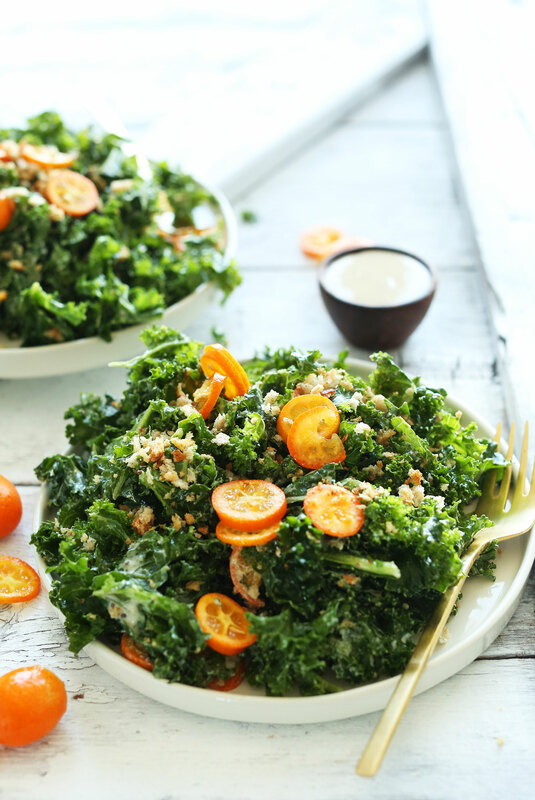 It’s the perfect balance of kale, kumquats, and crispy breadcrumbs all topped with a zingy dressing. This salad is simple, requiring just 30 minutes and easy-to-master methods. For instance, do you know how to massage kale? No? Allow me to demonstrate. One hand in the bowl, squeeze away the day’s stress. It’s as easy as that. And that dressing? Oh, you’re gonna want that. Tahini with lemon and orange juice, a touch of maple syrup and water to thin into a spectacular pourable sauce. This stuff is the icing on the kale cake, so to speak. What more could you ask for? Serve this as a side salad to impress friends at your next BBQ. Can you imagine showing up and being all, “Hey Lindsay, hey Todd. My week was good. Oh, what’s this? 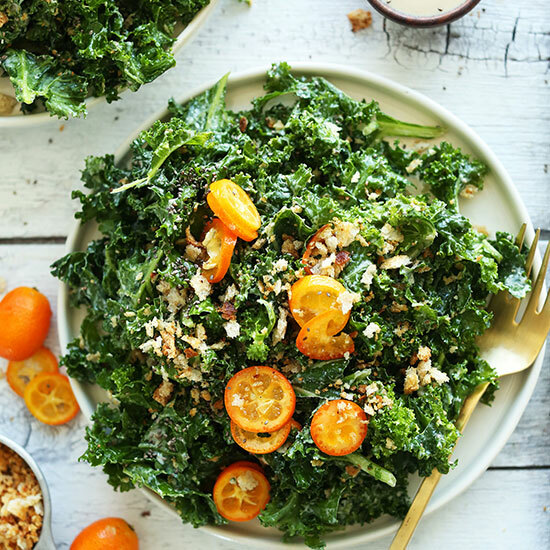 It’s a kumquat kale salad with toasted breadcrumbs and a tahini dressing.” And then they’re all, “WHAAATTTT?” Instantly, you’re the cool kid at the party. Alternatively, bulk this salad up with some protein to magically transform it into an entree (suggestions below)! If you do give this recipe a try, let us know what you think! Leave a comment and rate it – it’s really helpful for us and other readers. And don’t forget to tag a picture #minimalistbaker on Instagram! We love seeing what you come up with. Cheers, friends! 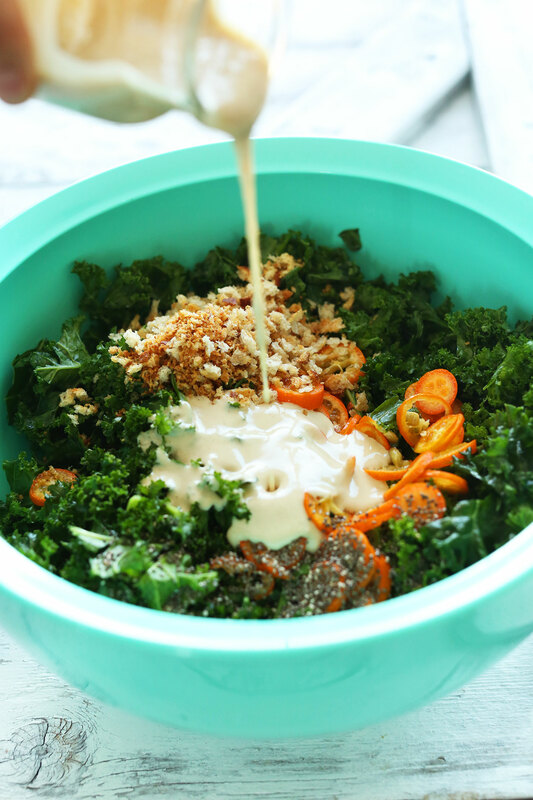 30-minute kale salad with kumquats, toasted bread crumbs, chia seeds, and a creamy tahini-maple dressing! A healthy, quick plant-based side dish. Heat a large skillet over medium heat. Once hot, add half of the olive oil (1/2 Tbsp as original recipe is written // adjust if altering batch size), breadcrumbs, a pinch each salt and pepper, and vegan parmesan cheese. Sauté until browned and crisp - about 5 minutes - stirring frequently (turn down heat if browning too quickly). Set aside to cool. In the meantime, add kale to a large mixing bowl with lemon juice and remaining olive oil (1/2 Tbsp as original recipe is written // adjust if altering batch size). 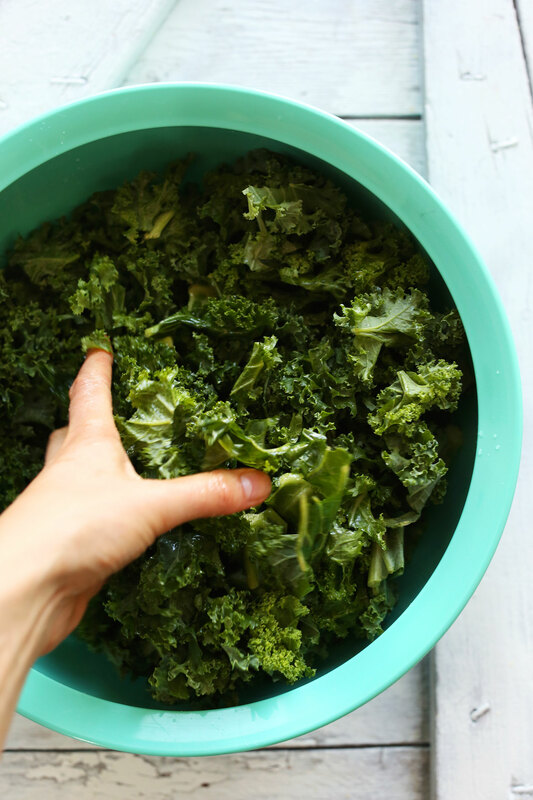 Use your hands to massage the kale and break down its texture a bit. To a separate mixing bowl add tahini, lemon juice, orange juice, maple syrup and a pinch of salt and whisk to combine. Add water or almond milk to thin until pourable, whisking to combine. Taste and adjust seasonings as needed - set aside. 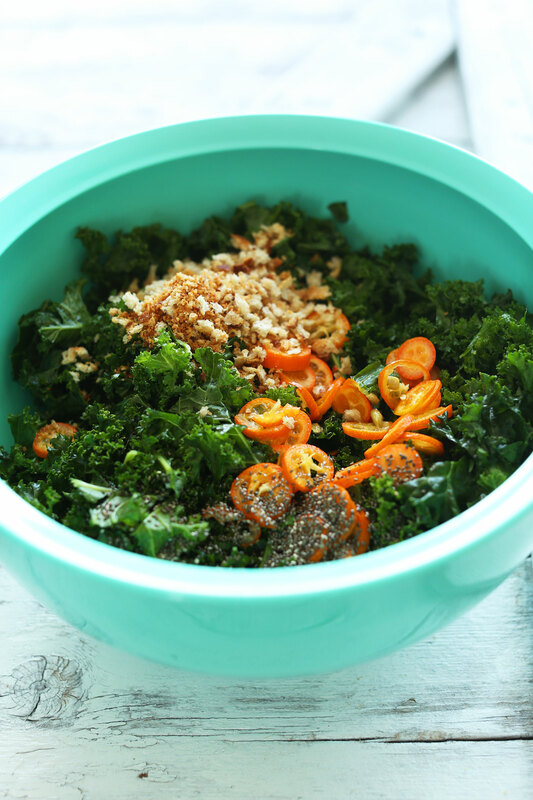 To the kale add sliced kumquats (reserving a few for garnish), chia seeds and toasted bread crumbs (reserving half for topping). Add most of the dressing as well and toss to combine, reserving a bit for serving. This salad makes an excellent side dish to meals like veggie burgers, pizza and spring rolls. But you can also add your protein of choice to make it a more substantial entree, such as quinoa cooked in vegetable stock, crispy chickpeas, or brown sugar pecans. Best when fresh. Store leftovers in the refrigerator for up to a few days with the dressing and bread crumbs separate for best results. *Inspired by the kale salad at Lardo in Portland, OR. Looks great! I have ti ask though, where are the 25 grams of fat coming from?? Oooo, I WILL be making this! Do you think spinach instead of kale will still be yummy? Also, I’m excited to try tahini! Hi! I haven’t tried it with spinach but that should work! Let me know how it goes! Good luck! I had that salad at Lardo’s. And lemme tell ya, it’s everything you said and more! So excited to try this out! I love Kumquats. We are trying to grow some from seed… so far we only have a seedling, but who knows, right ? Never tried tahini but heard a lot of praises on it, so must give it a try! Dana, I can’t remember how but I found your site about a year ago. I LOVE it. You are one of the few sites I come back to because your philosophy of food is so similar to mine and everything you make is REALLY good. Thank you so much for sharing food inspirations! Amazing. Unfortunately I don’t think I can get a hold of kumquats where I am in the UK. Would there be a good substitute for them? I mean, I’m definitely going to make it either way but if there’s something I could use instead that would be super. 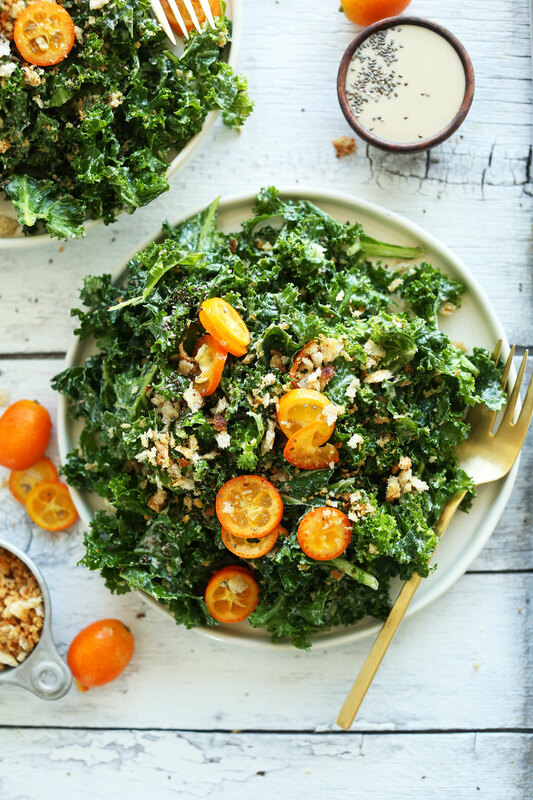 This looks like a beautiful way to prepare and eat Kale. Am I in the twilight zone? I just for the very first time, literally an hour ago, ate a kumquat. Then I come to my computer to find this salad! Doo doo doo doo (my failed attempt at making the Twilight Zone Theme music). I love this idea. They have such an intense and great flavor. I can’t wait to play around with them. Oh yay! You’ve found one of my favorite restaurant salads in existence! I know right? Tahini in anything = magic! We will be visiting Portland for the first time in August. We’ll have to check out Lardo and hope this salad is on the menu! Any other vegan-friendly places you would recommend? You must! We’re publishing a Portland food/activity guide soon, so stay tuned! We’ll share about it on social media. Ha! It’s a thing! Hope you love it, Jennifer! I’ve never had a kumquat! Perhaps it is time to try, because this salad looks absolutely fantastic. I love that you take inspiration from restaurants for your recipes. It’s awesome! Looks so great and yummy!!! perfect for the summer weather at the moment! Thanks for this great idea!! !